This section contains the product’s most basic properties, beginning with its name and number and ending with a webpage name of varying customizability based on the user’s needs. The General Products screen is comprised of the properties and functions listed below. Created By: Indicates the cart’s user who created the product originally. Access Granted To: Specifies what level of user may access and edit the product. Created: Indicates the date on which the record for the product was first created. Modified: Indicates the date that the product was last modified. Category: This dropdown has values in format: [NUM] NAME, where NUM is the number of products under the Category. If the NAME ends with [-] then the Category is not active or it does not have active products. The selection in this field indicates to what Category Type, Category, and Subcategory (if applicable) the product belongs. Product Name: The name of the product in text format as defined by the user. Product Name (user …): The name of the product in text format that will be applied only to the currently active user. Product Number: This value is assigned by the user and may be any alphanumeric value that distinguishes the product. Sort #: An alphanumeric value that dictates the order in which the products will be displayed. Weight: The weight of the product in pounds (lbs). Width: This width value is assigned by the user and is used for the purpose of shipping information. Height: This height value is assigned by the user and is used for the purpose of shipping information. Length: This length value is assigned by the user and is used for the purpose of shipping information. Cost Price: This price indicates the cost of the product to the seller. List Price: This price indicates the price that competitors are charging for the same product. The List Price will be shown on the product pages if it is less than the calculated Final Price of the product, so the buyers can notice the difference. The List Price is an amount that does not participate in the calculation of the Final Price, but serves only as a display on the product pages if enabled and if necessary. Selling Price: This is the price of product that is common for all users. It is the Final Price that the customer will pay for the product before any discounts, coupons, or taxes are applied. Discount (user …): A percentage or dollar value representing the difference in the selling price for the current product between the value entered in the Selling Price field and the selling price which is displayed/charged on the website. User Price Diff ($ or %): Entering a value in this field will accordingly increase or decrease the Selling Price of the product for the active user only. WebPage Name: This field grants the ability to specify the generated page names to be non-fully (with extra suffixes) or fully (no extra suffixes) customized. Just prefix the customized page name with an equals sign ( = )to have the fully customized page name in effect. The non-fully customized page names have the advantage to allow the system to append suffixes to make sure the page names are unique throughout the entire web site. For Example: If the page name is specified as =interactive_phone_module then the generated page name will be interactive_phone_module.html and if the specified one is interactive_phone_module then the generated will be interactive_phone_module_123_prd1.htm, assuming the internal ID of the product is 123. WebPage Name (user…): This field grants the currently active user the ability to individually specify the generated page names to be non-fully (with extra suffixes) or fully (no extra suffixes) customized. Just prefix the customized page name with “=” to have the fully customized page name in effect. The non-fully customized page names have the advantage to allow the system to append suffixes to make sure the page names are unique throughout the entire web site. If a unique page name is entered in this field, it will be valid only for the currently active user. ID (foreign): This value is not automatically assigned to a product, but it is necessary for the updating of products via the Import Engine. It must be an alphanumeric value that is entirely unique to each product. Follow-up Product: The product that will be offered to the customer in an event where the current product has been discontinued or inactivated. Is Category Type Active: This indicates whether the Category Type is active. Is Category Active: This indicates whether the Category is active. Is Product Active: Selecting “Yes” from the dropdown, will make this an active product. Back: Selecting this link will return the user to the previous screen of products, typically the Browse or Search screens. New Product: Selecting this link will open a panel where the user must first designate a Category Type, Category, and Subcategory (where applicable) for the location of the product. Then the user must enter a name before continuing. 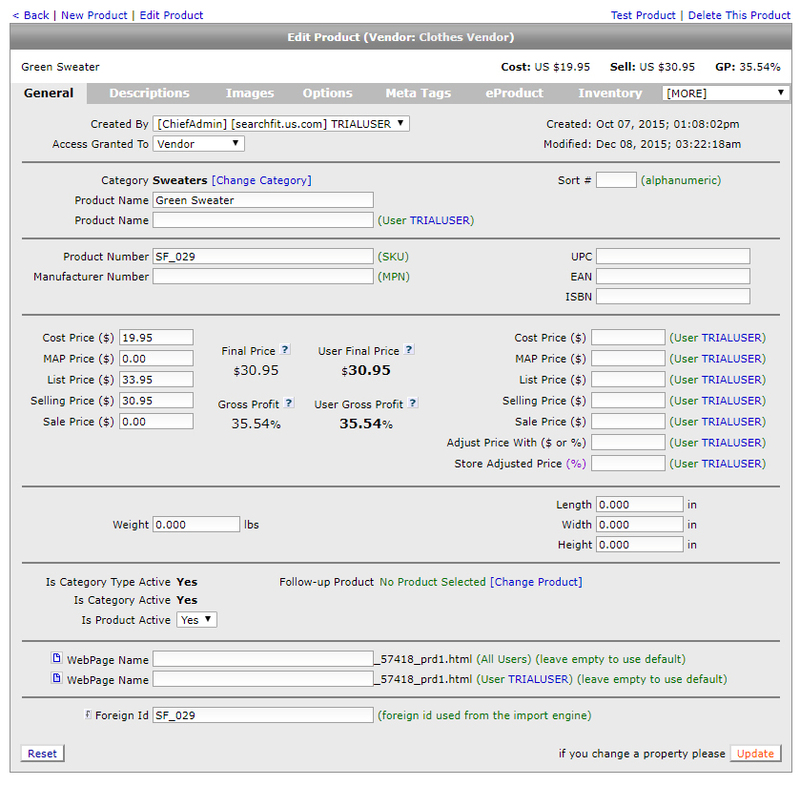 Upon continuing, the user will be redirected to a new General Product screen where the rest of the product’s information can be entered. Edit Product: Selecting this link will open a panel where the user must first designate a Category Type, Category, and Subcategory (where applicable) where the desired product is locate. Then the user must select the name of the existing product from a dropdown menu before continuing. Upon continuing, the user will be redirected to the corresponding General Product screen for the specified product. Test Product: Selecting this link will redirect the user to a page where the selected product’s information is displayed in Product Template layout for the user to review. Delete This Product: Selecting this link will remove the product from the database. Use with caution. Once done, it cannot be undone. Follow-up Product – Change Product: Selecting this link will allow you to assign a follow-up product to the current product. When follow-up product is configured, the user will be automatically redirected (using HTTP 301) to the follow-up product page when the discontinued product is requested. Choose Category Type: A dropdown selector that allows you to choose the category type that the product of choice may be within. Choose Category: A dropdown selector that allows you to choose the category that the product of choice may be within, based on the category type selected. Choose Product: A dropdown selector that allows you to choose the product, based on the category selected. Enter Product Name or SKU: A text field that allows you to input the name of the product or the product SKU that you would like to use as a follow-up product.